Italian Pizza vs. Pasta Throwdown!! For our April class, Thursday the 11th, we will be pitting two iconic Italian dishes against each other for the title of all-time favorite Italian dish. We will share tips for stretching pizza dough, baking pizza in a home oven, cooking pasta, making sauce, and what toppings to turn to for healthy & balanced flavors. Which dish will reign supreme??? Join us for the release of Self Portraits, Mixed Media by Aldo Leoploldo Pando Girard, Ann Arbor’s Youth Poet Laureate! Aldo will read from his poetry collection, followed by a Q & A and book signing. This event is FREE and open to the public. The venue is not wheelchair accessible. We will close out this month-long program with a culminating event at the downtown Ann Arbor Library, featuring a performance and Q&A with our visiting artist Kush Thompson (out of Chicago, by way of New Orleans.) Leading up to her reading, members of the teen book club will share their poetic responses to Citizen and identity collages made by community members will be displayed for viewing in a gallery. Neutral Zone drop-in and programs are closed to teens during spring break, March 25 to March 29. We will be open to teens again on April 1. 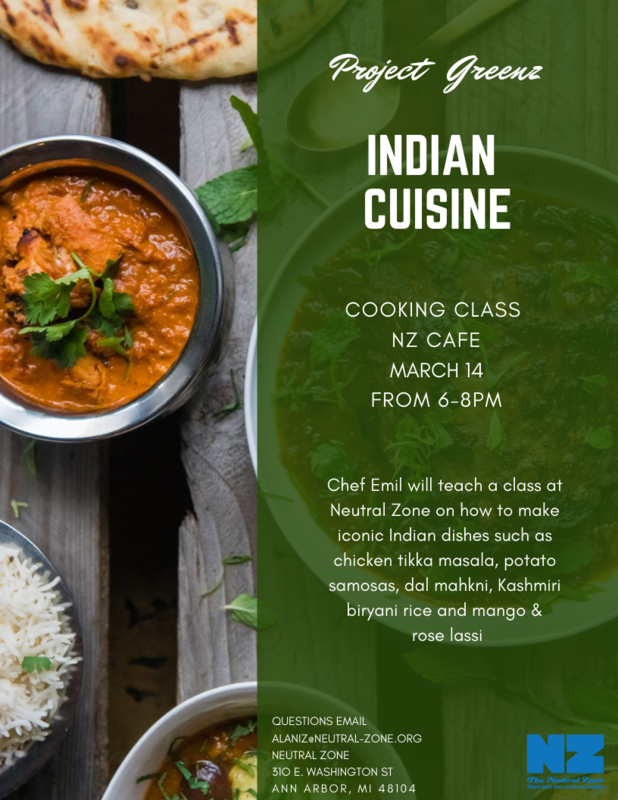 Neutral Zone youth leaders will host a "citizenship dinner" for the public. Community members who attend will share a meal and engage in discussion of Citizen. Guiding questions and activities for the evening will encourage small group conversation and center on the theme of identity and definitions of citizenship, with a focus on the experiences of immigrants and refugees in the US. Neutral Zone youth leaders will perform original poetry to further explore the themes of Citizen. A simultaneous citizenship dinner will take place on the University of Michigan campus, following a similar format and addressing the carceral state with a featured performance by Cozine Welch of the Prison Creative Arts Project. At this public art workshop, participants will examine the visuals in Citizen: An American Lyric by Claudia Rankine and study various artists who use collage to address issues of identity and social justice. They will be provided with materials to make their own collages and write artist statements that will be hung in a gallery at the culminating event. This workshop will be led by local visual artist and poet Anika Love. Want to join hundreds in the Ann Arbor and Ypsilanti community as we read and discuss Citizen through the month of March. Bring your copy of Citizen (we will have them for purchase as well) to Literati’s monthly book club! A night of chill vibes, acoustic music, poetry, and artistic self care fundraising for Live On Washington (June 8th!) Come take your shoes off. 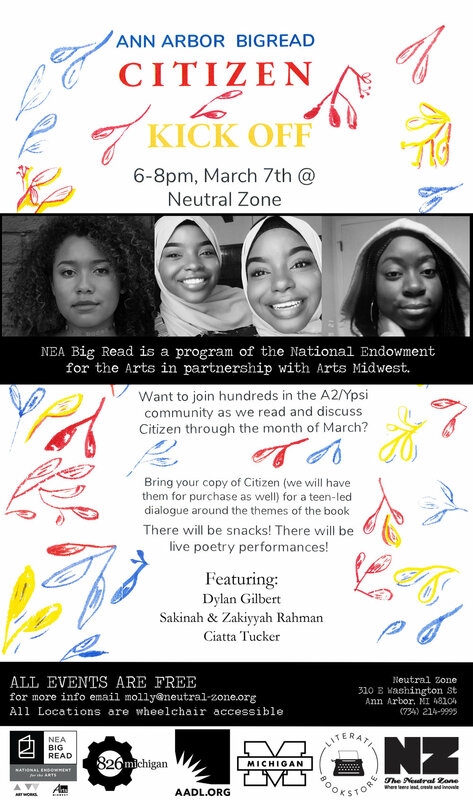 Come join us to kick off the month-long community project, "Neutral Zone Presents: NEA Big Read in Ann Arbor." Members of the Ann Arbor community and surrounding cities will come together throughout March 2019 for critical explorations of race, gender, class and other intersecting identities, centered around a deep dive into Claudia Rankine’s National Book Critics Circle Award-winning collection of poetry, Citizen: An American Lyric. The month-long program, presented by the Neutral Zone — a diverse, youth-driven nonprofit — was made possible by a grant from the National Endowment for the Arts. At the kickoff event, community members will enter the conversation central to the program by reading passages from Citizen and responding to them in small and large group conversation. 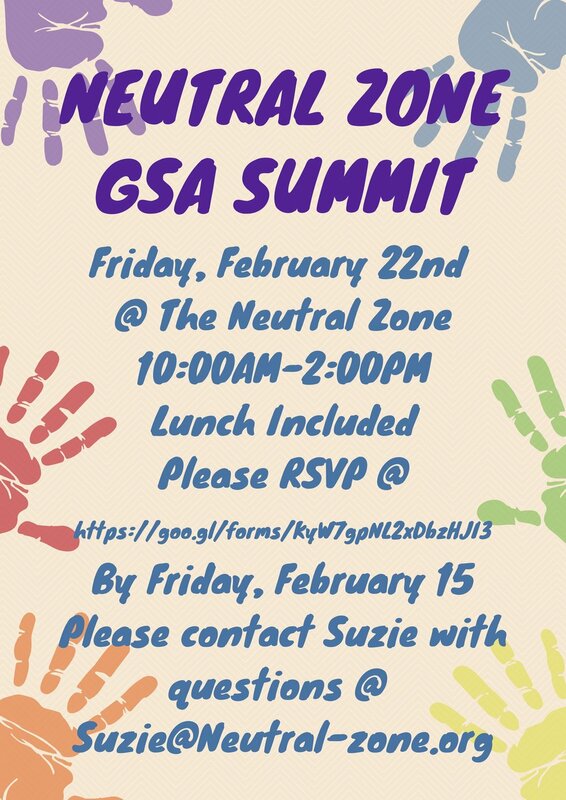 At the event, youth leaders from the Neutral Zone and Ozone House will also perform original poetry invested in the themes of Citizen: namely, the experiences of women of color, intersectionality, micro-aggressions, and what it means to be "citizen." NZ is closed February 14th through the 18th for Mid Winter Break. We will resume normal hours Tuesday, February 19th. NZ is closed February 15th through the 18th for Mid Winter Break. We will resume normal hours Tuesday, February 19th. Join us to kick-off our new weekly workshop that will culminate with a performance & publication of you work in May. Facilitated by Ann Arbor Youth Poet Laureate Aldo Leopoldo Pando Girard. 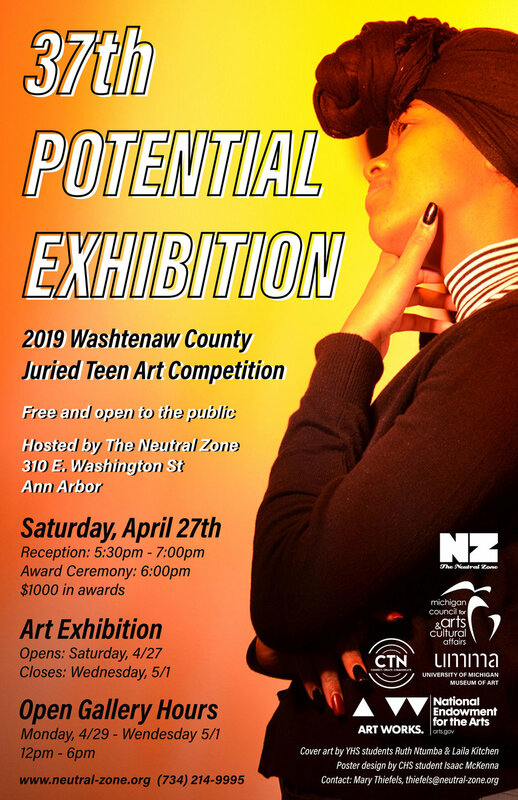 The Teen 24-Hour Film Competition is a collaborative effort between the Neutral Zone, Community Television Network (CTN), and Ypsi 24 Hour Shootout for the purpose of supporting the teen independent filmmaking community in Southeast Michigan. The competition offers an opportunity for area teen filmmakers to match their talents against their peers while competing for cash prizes. With support from a dedicated team of volunteers, and generous community support, we are proud to be able to bring the competition to the Ann Arbor area. The event, a competition, happens in a 24-hour time frame. Each participant is allowed to assemble a team and crew. At the start of the competition, several required “ingredients” will be announced. For example, they may include a line of dialogue, a prop, or a location. These elements force teams to think on their feet and not rely on pre-planned scripts or material. Final video files must be delivered to the Neutral Zone within the 24-hour deadline to be considered for the cash prizes. Filmmakers need to submit their completed film on the USB drive provided to them at the kick-off event. All entries will be judged by an independent jury who will award prizes to the best films in the competition. The Teen 24-Hour Film Competition will be held on Saturday, February 2, 2019 to Sunday, February 3, 2019. The competition will kick-off at Neutral Zone at 10 a.m. on Saturday, February 2nd. Film will need to be delivered back to the Neutral Zone by 12 p.m. on Sunday, February 3rd. The public screening will be February 11th from 5-7pm The screening will be held at Neutral Zone. The competition is open to filmmakers between the ages of 13 and 18, with parental permission. Films must be 2-5 minutes long including credits. No shorter and no longer! All films must include the required “ingredients”. The grand prize for “best of show” is $500. There are no restrictions to what type of film you can produce. All film genres are acceptable (i.e. narrative, documentary, experimental etc…) Films deemed overtly offensive or inappropriate may be denied a public screening and disqualified from awards. All films must be shot within the 24-hour period. Pre-made sound effects, music, or other abstract elements may be used. A team must be registered under a single team leader; however all participants need to have a consent form signed by their parents if under 18 years of age. There is no limit on team size; the cast and crew must volunteer their time. You can also go it alone! Individuals over 19 years of age may serve as drivers and may be an actor in your film, but can not otherwise participate. Individuals under 13 years of age may be used as an actor in your film. All participants must complete a Consent Form that is due on or before the day of the competition. It must be signed by a parent if participants are under 18 years of age. Our 2nd Annual Youth Driven Spaces Conference is an opportunity for community-based organizations and schools in SE Michigan to participate in an exciting day of networking, professional development, youth-led sessions and dialogue centered on youth voice in our region. The conference will feature youth-led sessions about youth driven projects happening in the region and a “pitch” session, where youth will present ideas to the conference to earn funding for their youth driven initiatives.